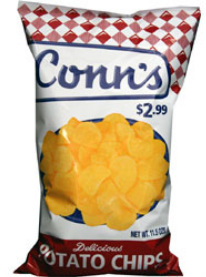 Mrs Ida Conn perfected her potato chip in 1935 and since that date Conn's Potato Chips, a family owned potato chips manufacturer, has satisfied millions of American snackers with their premium potato chips and delectable snack foods. 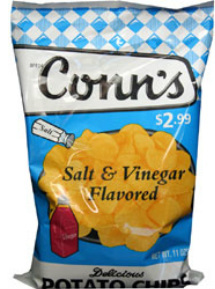 Mrs Conn carefully selected the best chipping potatoes, the purest vegetable shortening and salt, and created potato chips that have set the standard for good tasting chips for over seventy years. It is a lot different to when the enterprising businesswoman delivered her popular potato chips to her customers in a market basket. Although, even today, the chips company recognize more than ever that their continued success must be built upon giving that same personal touch. Conn’s Potato Chips continues to set the standard for freshness, as well as taste and texture, from Central and South Eastern Ohio to West Virginia. “Striving to make the finest quality product”, the company concentrates on its four business areas: Sales of potato chips and other snack foods to major food store chains and convenience stores, Contract manufacturing, Private label branding, and The Conn’s Potato Chip line. Current owners, Montie Hunter and Tom George, Sr., know their company is poised for tremendous growth in the 21st century and beyond. ​When Conn’s out-grew two smaller facilities in Zanesville and Lancaster, Ohio respectively, the owners invested in the future of Conn’s with the construction of a new 100,000 square foot facility and new state of the art equipment in Zanesville. 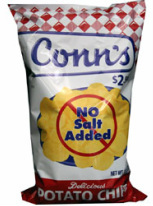 At their modern facility, Conn’s still prepares it products with the same care and quality ingredients that have made their potato chips a favorite for generations. Conn’s looks forward to meeting the needs of its customers well into the next generation.